The Upper Onion Creek project area is located in the Onion Creek Neighborhood near Pinehurst Drive and Wild Dunes Drive. A feasibility study completed in 2017 recommended buyouts for 138 houses in this area. We have divided the houses into four groups. Recovery Buyouts – In 2017, the Austin City Council directed us to offer buyouts to 10 homeowners. 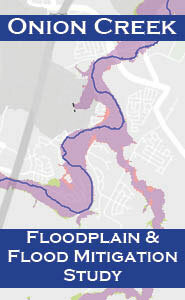 The houses were selected based on flood risk and date of ownership. We have completed these buyouts with nine homeowners choosing to participate. All nine houses have been demolished. Phase 1 – Phase 1 consists of 50 houses and was approved by the Austin City Council on March 22, 2018. We have contacted all the property owners to begin the buyout process. As of March 21, 2019, we have made 48 offers and 47 have been accepted. We have closed on 39 of those properties and demolished ten. Phase 2 – Phase 2 consists of approximately 78 houses and was approved by the Austin City Council on March 28, 2019. Through the 2018 bond, we have funding to purchase about 50 of these homes, about ten a month. We plant to budget the remaining funds in Fiscal Year 2020 as part of the regular City of Austin budget process. Phase 3 – Phase 3 consists of a small group of houses that could become isolated by the buyout of neighboring properties. Phase 3 was authorized by the Austin City Council at the same time as Phase 2. We plan to budget funds for Phase 3 in Fiscal Year 2020. Participation in these buyouts is optional. Note that Upper Onion Creek is a bit of a misnomer. The area is the upstream area of Onion Creek within the City of Austin. However, when looking at the entirety of Onion Creek watershed, the area is in the lower third of the creek. This is partly why the area is subject to severe flooding, given a heavy enough rainfall. The maps below show the houses that have been bought as of April 2019 in grey. Phase 1 houses that are in the buyout process are shown in red. Phase 2 houses are shown in blue and Phase 3 in green. The top map shows the Pinehurst Drive area and the bottom map shows the Wild Dunes area. The City of Austin will test the houses for asbestos, abate any asbestos found and then demolish them. We will remove the foundations, walkways and driveways to the edge of the right of way. We leave the driveway approaches in places. Utility connections will be terminated and capped. The lots will be regraded and revegetated. The land will be designated for open space in perpetuity. In the short-term, we will add the properties to our vegetation control schedule and mow them six times a year during the growing season. Long-term, we will work with the neighborhood to develop options and plans for the future. The options may include nature trails, community gardens, wildflower meadows and open space for the neighborhood to enjoy.